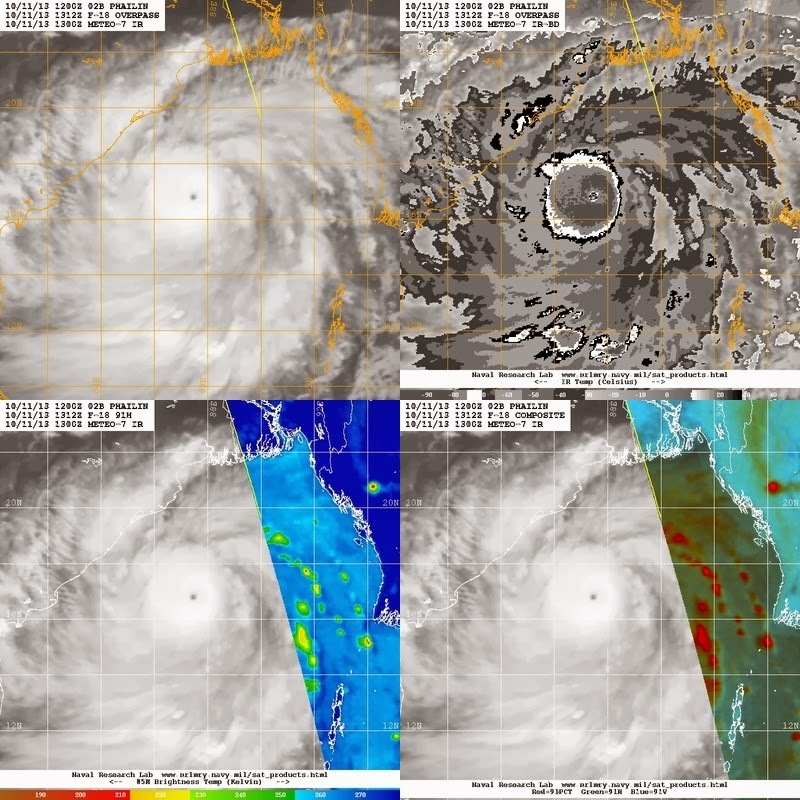 Super Cyclone "Phailin" Core Pressure drops further to 915 mb with core winds at 270 kmph !! Expected intensification which spurted after recycling of eye, would "stabilise" now onwards. This is also justified by the fact that the difference between cloud tops in the eye (-21c) and outer clouds (-80c) has narrowed from the previous 80c difference. The rainfall rate map shows the coastal regions have started receiving rains at at least over 25 mms/hour. Expected to reach the Odisha coast by Saturday afternoon/evening. On reaching land, the cyclone will be around current strength. The likely strike area is likely to be near Gopalpur . Gopalpur, Bhubaneshwar and Cuttack are in the heavy rainfall and winds zone. Besides this, Srikakulam district should be alerted for heavy rans and winds. Rainfall will be extremely heavy in the strike regions, where the precipitation may be around 250-300 mms in the first 24 hrs. 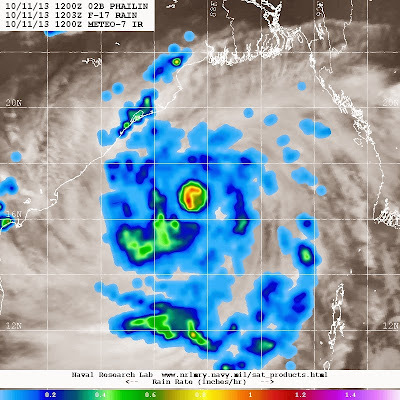 Super Cyclone "Phailin":...Its Cat 5 !! As mentioned, "Phailin" original eye was absorbed by the outer ring, and subsequently we saw a decrease in intensity from 930 mb earlier to 935mb. Winds also reduced marginally during this time. However, the replacement cycle is now almost completed, and a new eye is consolidating itself. This would encourage the re-intensification of Phailin in the next 12 hrs. Very rapid intensification has resumed, and current core pressure is estimated at 920 mb...and winds at 260 kmph...satellite image visuals and calculations depict a slightly stronger system. Tracking NW, and expected to centre on AP/Odisha coast with a greater intensity. Centre will cross land around Saturday evening, BUT, storms and winds will commence by morning ! Tracking NW, "Phailin" will move towards the AP/Odisha border. Srikakulam, Vizianagram and Vizag District (AP) should be seriously alerted. And Gajapati and Ganjam Districts of Orissa should be alerted...and all regions along North AP and Odisha coast. Damage will be maximum. 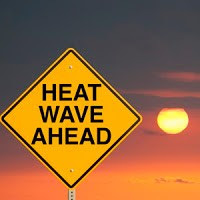 Please consult and adhere to Local authorities warnings ! "The weather office may be underestimating the severity of a cyclone which is hurtling towards the east coast, a meteorologist warned on Friday." Cyclone Phailin is forecast to hit the coast between Kalingapatnam in Andhra Pradesh and Paradip in Odisha late on Saturday with a maximum wind speed of 220kmph (135mph), the India Meteorological Department (IMD) said in its latest bulletin. And this: "Phailin is already worse than what the IMD is forecasting. A recent satellite estimate put Phailin's current intensity on par with 2005's Hurricane Katrina in the United States," said Eric Holthaus, meteorologist for Quartz, a US-based online magazine which covers global economy-related issues. "Everything I know as a meteorologist tells me this is the equivalent of a Category 5 hurricane — among the strongest on earth in 2013. That would mean Phailin could be the strongest cyclone ever measured in the Indian Ocean."...?? have there ever been a cat 5 cyclone in indian coast? Orissa super cyclone 1999 is probably strongest as of now - this happened around 25-October-1999. It should be noted that with massive destruction of human lives, crops, live stock, super strong winds- this cyclone resulted in terrible droughts over TN,AP,KAR. In fact NEM formation never took place. In fact 19971998,1999,2000,2001 TN/AP/interior of KAR had years of consecutive droughts - most of these years October/November depressions over bay missed SE India. just wondering movement of this cyclone over NW -> Orissa, MAHA,MP,GUJ,RAJ will again result in rains over MAHA, GUJ, MP,RAJ..UP delaying SWM with drawl.